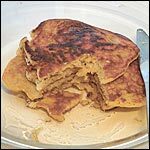 Here's all the recipes listed under Healthy Pancakes along with the comments posted by the breakfast lovers that submitted them. "This pancake may be low carb, but it is definitely NOT low on flavor! This is probably my favorite breakfast food EVER!" "Healthy and tasty. Just 5 ingredients (plus seasoning). 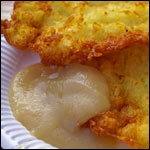 They cook up crisp and are best served with apple sauce on top. You'll love these groovy pancakes." 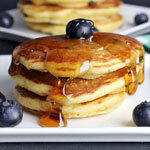 "These pancakes are great with maple syrup. My favorite is to top them with applesauce and drizzle on just a touch of maple syrup. I hope you like them as much as we do." "I like to serve these with applesauce, plain yogurt, or honey, depending on my mood. Any way you eat them, they're a delicious, healthy meal, and a great way to get more veggies into your day." "These are great with I-Can't-Believe-It's Not-Butter and a drizzle of pure maple syrup. 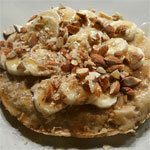 Another good way is fresh banana slices and whipped cream as a topping." 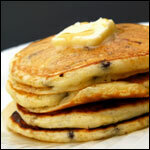 "Since my family tried these pancakes, I am not allowed to cheat with store bought mixes anymore! They come out so picture perfect, and they stay with you all day. Enjoy!" "This is a very easy way to take regular pancake mix and turn it into healthier and tastier pancakes. I hope you like it. Serve with warm maple syrup for best results." 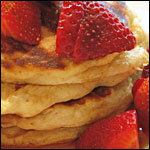 "A berry delicious pancake recipe courtesy of Driscoll's Berries. 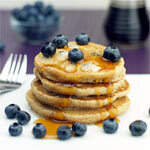 Picture perfect, healthier than usual pancakes." "These are great with a little "I Can't Believe It's Not Butter" and orange marmalade. They're also very nice with traditional butter and maple syrup. Enjoy!" "Only 2 Tablespoons of flour per batch. 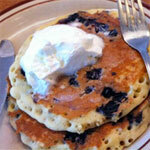 It's best to make silver dollar pancakes so they're easier to flip." "For being healthy and dairy-free, these pancakes are surprisingly fluffy on the inside and slightly crisp on the outside." "This interesting 5 ingredient pancake is comprised of bread crumbs, applesauce, sugar substitute, cottage cheese and cinnamon." "Over the years I've had to increase the number of servings of the original recipe and fiddled with it along the way. This is quadrupled." "Not just for breakfast. I eat one of these about every 2.5 hours. I'm dieting and so in a month I'll check my weight and see if it's been working but I have noticed my shorts are looser." "This weekend, I tried this recipe from my Healthy Cooking magazine. My son has an egg allergy so it's hard for us to find breakfast recipes. We all liked this one. I'd recommend it if you have to avoid eggs or not. They just taste great." "These are fantastic topped with applesauce. Good with syrup too." "Turn an old standard into a new breakfast experience to rival the best food that you can get from well-known pancake houses. This recipe combines a nice, light pancake with fresh or frozen fruit toppings." "These are delicious whether or not you have celiac disease. My kids even love them! Makes 12 medium sized pancakes." "Gluten-free pancakes whose texture and taste are pretty close to the pancakes you used to love before gluten-free was a thing you cared about." "I couldn't live without this recipe. They have an almost cookie-like texture. My daughter says they're better than IHOP." "When I found out I had celiac disease, my mom found me about 50 recipes to help me with my new diet. This one is by far my favorite. Thanks to my awesome mom - Cathy (aka Kitcat)!" 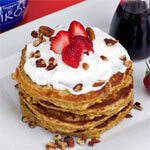 "* I like using vanilla yogurt to give the pancakes a more neutral taste, but you could use any flavor of Greek yogurt. If you use plain, I recommend adding a liquid sweetener so that the pancakes won't taste sour." "A modern version of an old favorite! The cool applesauce and sour cream mellow the bite of the pepper and onion. " 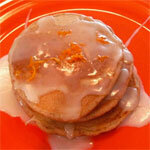 "Zesty, citrus-tinged pancakes that use fat-free lemon yogurt for their distinct flavor. For more citrus taste, add 1/2 teaspoon orange or lemon zest to the batter." 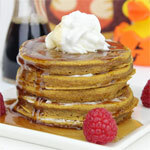 "A flour-less pumpkin pancake recipe that uses protein powder and flax meal. Best served with fresh fruit and sugar-free maple syrup." "Thin, crepe-like pancakes that you can fill or top with your favorite low-carb or carb-free syrup or jam." "This recipe uses stiffly beaten egg whites and unprocessed bran flakes to create low-carb pancakes. One serving has approximately 13 grams of carbs." "Moist and tender pancakes made with cottage cheese, stiffly beaten egg whites and just a hint of soy flour." 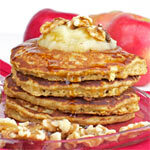 "Satisfy your pancake craving with only 13 grams of carbs. Ground flax is the base for the batter while cottage cheese provides moistness and flavor." "These pork rinds are surprisingly low in fat and have zero carbs. They may sound pretty crazy, but these little pancakes are fantastic!" "There's only about 6 grams of carbs in these pancakes made primarily of protein powder and sour cream." "Wheat gluten and whipping cream are the primary components of these low-carb pancakes." "Serve with a low-fat butter substitute and low-fat maple syrup. 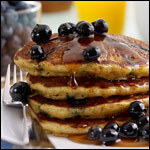 For a special treat, make the batter with either 1/2 cup walnuts or 1/2 cup blueberries." "A high-fibre tasty pancake. The consistency is not like the usual 'fluffy' pancake, however it still produces a light texture and will (hopefully) keep you fuller for longer. 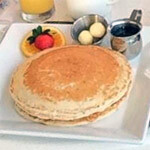 Produces approximately 4-6 thick pancakes, depending on size." "I'll sometimes add a few drops of vanilla extract to when I mix in the butter. The added flavor isn't really neccessary, but it's fun to mix it up a little. A couple dashes of cinnamon is nice too." 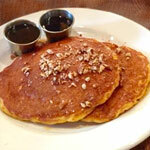 "A healthy serving of oats in a golden brown stack of pancakes." "Healthy pancakes to give you the focus and stamina of an medal winning Olympic marksman." "This is a very flavorful pancake that's great with traditional hotcake toppings, or just a slab of "I Can't Believe It's Not Butter"." "Add more milk or extra oat flour if you like your batter thinner or thicker. 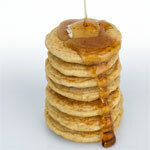 I like these with a little jam on top for the complete peanut butter and jelly oatmeal pancake experience." "Turn your oatmeal into pancakes. Great for an energy boost first thing in the morning. " "These are made with wheat flour, white flour, cornmeal and oats. We sometimes add a tablespoon or 2 of toasted wheat germ for added nutrition." "5 minute breakfast, to make it for more people just multiply the recipe." 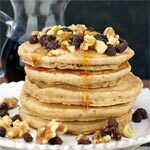 "For low-glycemic diets, this recipe combines prepared oatmeal with beaten egg whites to make pancakes." "You might have to add a little water to get the batter consistency just right. I like these because they have fresh strawberry flavor and you get some protein to start your day." "The banana adds all the sweetness you need. Great for diabetics like my dad. I hope you like it as much as us." "This is my way of making whole wheat pancake mix even healthier by adding protein powder and blueberries (antioxidants) and using egg whites and soy milk. It works for me every time and it's delicious." "You might also want to add 1/4 teaspoon of vanilla or a couple dashes of cinnamon to the batter depending on your tastes." "A heartier kind of pancake with grated potato, carrots and onion." "There's research that suggests flaxseed may improve heart health, fight breast and colon cancers, boost the immune system and provide other healthy benefits." "We made this a couple weekends in a row. I use soy milk and egg substitute to make it a little more healthy. Topped with warm maple syrup, it's great." "Wheat germ is the embryo of the wheat kernel that is removed during the refining of whole wheat grains to white flour. It's packed with important B vitamins, such as folate, thiamin, and vitamin B6, and the minerals zinc, magnesium, and manganese." 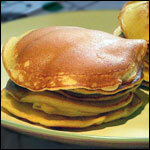 "For even healthier pancakes, use all whole wheat pastry flour. 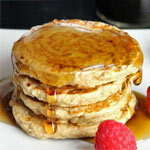 However, expect that your pancakes will have more of a healthy whole wheat flavor." "This recipe can easily be adapted for those who are not vegan and prefer milk. Simply substitute the same amount of milk for the soy milk." "These are really good with fresh berries and blueberry syrup. Enjoy!" "You'll forget that these are whole wheat once you taste the warm fresh blueberries and creamy vanilla flavor." "If you're like me, you probably have a can of pumpkin puree in the very back of the cupboard left over from the holidays. This recipe got rave reviews from my family. I hope yours likes it too." 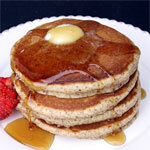 "Simple and easy recipe for a whole wheat pancake with a nice vanilla taste. For a twist, try adding a small handful of raisins to the mixed batter." "A great homespun gift for your favorite healthy breakfast lover! Print out a recipe card and attach it to the jar using the simple steps above." "These are wonderfully light, healthy, and relatively easy to make once you have the right pan. I actually use a flat non-stick pan but do add small amount of butter. They're almost a crepe, but thicker. If you leave out the baking soda, they'll be flatter and I've rolled various ingredients on them and rolled them up." 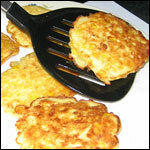 "These are more like potato pancakes or hashbrown cakes than flapjack stack cakes. They make a great side dish too."